The art of gossiping, gabbing and chatting with awesome book bloggers! Today, I'm featuring the all boyfriend-lovin', Red Bull-drinkin', Unicorn-Aficinado, PAULA from THE PHANTOM PARAGRAPHER! Thanks for stopping by! Let the Banter begin! Paula and her favorite book! Goodreads: 4145 ( Am the #25th Most Followed in New Zealand on Goodreads) Awesome! Average number of books read a month? I own a t-shirt that sums it up "Book Boyfriends: You Can Never Have too Many" Sure can't! "P's" and a Star for 5+ Books/ Highly Recommended Reads. 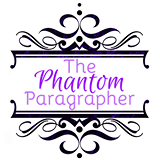 What was the very first post you ever made on The Phantom Paragrapher? Where is your favorite place to read? Coffee, tea, or wine while reading? I prefer to read in bed but can read anywhere I can curl up and depending on the time of the day - I am a tea drinker or Red Bull/Coke girl. If Young Adult Book Haven had a theme song, what would it be? "I'm Reading a Book" by Julian Smith. So you’re not just an awesome book reviewer, you’re also a librarian! Was starting a book blog just a natural thing to do since it’s practically your occupation or did it actually take some effort to get up and blogging? My two passions are reading and writing and I wanted someone to showcase my library book reviews so I started the blog and within six months it grew to people emailing me asking me to review their books. As I knew about Blogs etc , it didn't take that much effort but in saying that it has become busier over the last couple of years. Why did you choose to not showcase any books below a 3-star rating on your blog? I feel that if I can't finish a book then it's not really fair to the author and public to provide a review and as I am a positive person, I often feel that if you write a negative review, then you are placing all that negativity into your own system and also I always think about the author and how it would feel to them if their book was ripped to shreds in a bad review, as it's their heart and soul - their baby. On top of blogging and reviewing books, you also offer promotional services to authors. Which is your favorite way to help authors promote themselves and their books? I provide them with ideas on how to get their books out e.g Facebook groups and also provide them with other avenues to help get their book along. I am a big believer of promoting authors anyway I can , those who follow my Facebook page @ https://www.facebook.com/pages/The-Phantom-Paragrapher/196830633685451 will note by the many book teasers/trailers and pictures I post. What is the BEST thing about being a book blogger? The WORST? The best is the free books and also getting to know the authors on a personal level , I have even met a few of them when I went on holiday to the States in December and chat to quite a few of them regularly on Facebook. The worst is that some authors do not have good author etiquette and if they don't agree with your review or personal things have come up and you are taking a bit longer to review their book they can bombard you with abusive messages etc. There is also a lot of drama when blogging when it comes to the "Indie World and Self-Publishing world of authors". I can feel you on that. Some of these authors act worse than an infant that skipped naptime. Lots of bloggers are finding it more and more difficult to maintain a blog and keep up with real life demands at the same time. How do you manage blogging/promoting, being a librarian and all of the other things you have going on? I have always been blessed with excellent time management skills but also I try to allocate one day a week which is one of my day off work - Monday's to catching up with my blog and do a bit here and there during Tuesday to Friday . Saturday's and Sundays - I spend with my boyfriend so I have those free of blog duties. Time management is the KEY to everything, I say! A leprechaun offers you a pot ‘o gold and a rainbow. What amazing fantasy world exists on the other side of this rainbow? Love random questions and I always imagined it would be like Rainbow Brite's world. I loved her growing up and still do :) I have a Rainbow Brite T-Shirt . I would own a unicorn like Starbrite and it would be a happy and cheerful place. I always associate leprachauns with Rainbows which leads to me thinking about Unicorns. I honestly don't need the rainbow to see think about unicorns. Next week I'll be interviewing Allison from Allison's Book Bag! See you then!